The ultimate cultural symbol, the cross, symbolizes health, life, immortality, and the union of Heaven and Earth. Possessing spiritual power, the cross is a symbol of the triumph of good and a sign of infinite love. Wear this symbol to honor your personal beliefs in the cross. The panther ignites passion and willpower. Paired with the alchemical symbol of antimony, a metal that represents the animal in each of us, the panther is a fierce guardian of the heart. Awaken your wild heart and reclaim what’s yours. 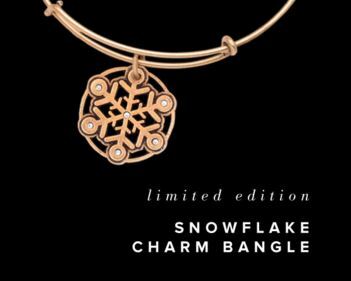 Get this years limited edition snowflake charm bangle, or any of our other alex and ani bracelets 15% OFF now though Sunday November 29th!